Is slightly bigger a lot better? Let's find out. The Samsung Galaxy S8 is a bit like the baddie in an episode of Scooby-Doo: it would have a good chance of being hailed the best phone in the world if it weren’t for the pesky Samsung Galaxy S8 Plus. The S8 Plus takes the standard S8 and turns everything up to eleven: it’s bigger, lasts longer, ruins pockets more quickly and costs more that its little sibling. Is bigger better? Let’s find out. The Galaxy S8 and Galaxy S8 Plus clearly come from the same stable, but there are some key differences. The S8 is 148.9 x 68.1 x 8mm and weighs 155g, while the S8 plus is 159.4 x 73.4 x 8.1mm and weights 173g. The S8 Plus screen is just under half an inch bigger than the S8, although it delivers the same pixel count. Unlike Apple, Samsung has managed to make the S8 and S8 Plus IP68 water and dust resistant without sacrificing the headphone port. Both models are protected by fifth-generation Gorilla Glass. Samsung calls the nearly bezel-free display the Infinity Display, and it means the front of the S8 and S8 Plus are smooth without buttons or sharp angles. As with the previous Galaxy it's an always-on display, as AMOLED technology means that individual pixels can be lit without having to light the entire screen. The Galaxy S8’s 5.8-inch display delivers 2,960 x 1,440 pixels, more than twice the pixels of an iPhone, and the pixel density is a whopping 570ppi. The S8 Plus display is bigger - 5.2 inches - but offers the same 2,960 x 1,440 pixels. That means a lower pixel density of 529ppi, although we doubt you’d spot the difference without putting the screen on your eyeball. Both displays are certified by the UHD Alliance as Mobile HDR Premium, which means they deliver video the way the filmmakers intended. But on a smaller screen. 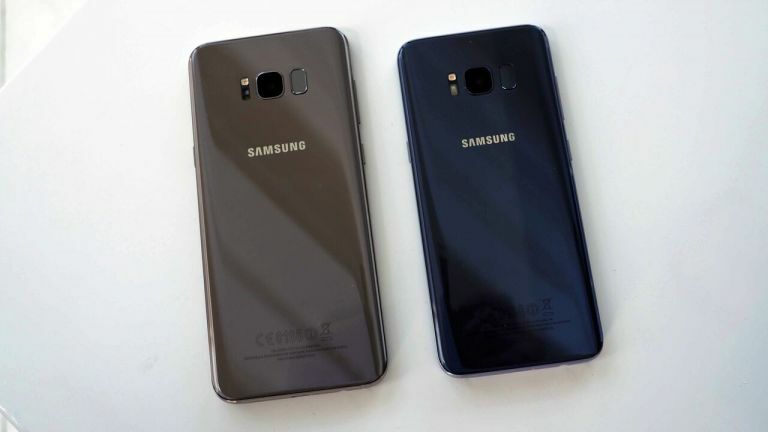 Both versions of the Samsung Galaxy S8 will be available in various flavours. The headline processor is a 64-bit 10nm Octa-core 2.3GHz Quad, but some markets will get the Snapdragon 635 or Samsung Exynos processor. There’s 4GB of RAM and 64GB of on-board memory, expandable via microSD cards. Both the Galaxy S8 and Galaxy S8 Plus support microSD cards up to 256GB. The camera in the Galaxy S7 was pretty great, and so is the one in the S8 and S8 Plus: both models get a 12MP Dual Pixel rear camera with an f/1.7 aperture for great low light performance and an 8MP f/1.7 aperture front camera with smart autofocus. Samsung has offered wireless charging and fast charging for some time, and the Galaxy S8 continues the trend with a hefty 3,000mAh battery that’s compatible with quick charging and wireless charging. The S8 Plus battery is bigger still at 3,500mAh, although that bigger battery is also driving a bigger display so we wouldn’t expect the same kind of dramatic differences we’ve seen between the iPhone 7 and iPhone 7 Plus. Both devices come with some genuinely useful features, although one of them, the Bixby personal assistant, won’t launch in UK English until later this year; for now it’s US English only. Iris scanning is better, and you'll be able to choose from a variety of biometric security features including fingerprint scanning, iris scanning and facial recognition. Samsung's Knox security platform is baked into the device, and if that's good enough for the military it's good enough for us. Both LTE and Wi-Fi are now gigabit and the earbuds are made by AKG, the result of Samsung’s acquisition of Harman. The connector is USB-C, and there’s a new version of the Gear VR to fit the S8 with backwards compatibility for the S6 and S7. There’s also DeX, a dock that enables you to use the S8 or S8 Plus as a desktop computer in much the same way that Windows Phone can become a desktop, although hopefully it’ll be a bit more popular than Microsoft’s version. The S8 and S8 Plus can also run two Bluetooth audio streams simultaneously to deliver multi-room audio with individual volume controls, which is pretty handy. The UK price for the Galaxy S8 will be £689 and the S8 Plus will be £779. Pre-orders open on 29 March and close on the 19th of April from Samsung.com/uk. To begin with the UK will get the Midnight Black and Orchid Grey models, with Arctic Silver possibly coming along later. There's no doubt that the Samsung Galaxy S8 and S8 Plus are fantastic devices, but is the Plus £90 fantastic-er? The screen is a little bigger but no sharper and the benefit of the bigger battery is likely to be negated by the need to drive a bigger screen. It's nice to have a choice, of course, but unless heavy discounting makes the price of S8 and S8 Plus come closer, we think the smaller S8 is the phone for us.